I struggle. It seems to be in my nature. Nothing can be easy for me. I must find a way to over-analyze, stretch, crumple into a ball, process, leave to rise and eventually start over again. This is my love affair with halacha, Jewish law. This is my love affair with Judaism. I am proud of my hecksher kosher home, but still want to be able to eat out (vegetarian). I am proud of my commitment to modesty and covering my hair, but I still want to be able to put on a swimsuit and swim in mixed company. I am proud of our family's dedication to Shabbat, but there are times when I feel we need the spirit of Shabbat and as such, compromise the laws to a certain degree. I enjoy a music-free traditional service, but appreciate the participation by women and their contribution in that manner. I am acutely aware that how and what we do Jewishly is impacting my children. That they learn through and by our example. It is important to me that my children at least feel comfortable in and out of any kind of Jewish circle from the interpretive to observant. I am also aware that they are missing out on the community aspect and joy of Shabbat by us being so isolated here in the county. The occasional "Friday night dinner" with guests is not really providing that atmosphere for them. I guess what I really want is a Conservative Jewish observance with an Orthodox community experience. Erin says that this exists if we lived in U City. I would love to move. You have NO IDEA how much I would love to move. However, I need to finish getting all of my debt paid off and that seems impossible to accomplish with a child in day school and another with ongoing medical bills. This past Shabbat, I spent Friday night with a group of women and it so felt like Shabbat to be surrounded by them, laughing, debating, discussing, eating, interacting. 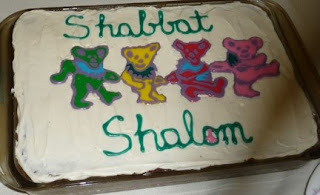 I want that spirit at my home Shabbat. How do I do that -- in West County, with a 15-year old, 8-year old, 2-year old -- ?! I loved and identified w/this article. And yeah, I'm all for you're moving to UC! If you do, I'll give you a housewarming gift of one free night of babysitting!